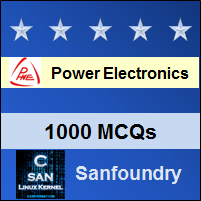 This set of Power Electronics Multiple Choice Questions & Answers (MCQs) focuses on “Sequence Controller”. 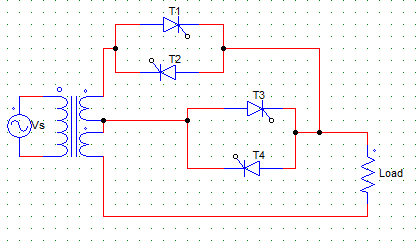 Explanation: It is used to improve the power factor at both the input and output side. Explanation: Sequence control of ac voltage controller means the use of two or more stages of voltage controllers in parallel for the regulation of output voltage. 3. From the below given statements regarding sequence control of ac voltage, which of them are true? Explanation: All of the above are the advantages of using two or more stages of voltage controllers in parallel. Harmonic content is reduced at two common parameters get cancelled out. Explanation: If T3 and T4 are fired at an angle of 180°, they are equivalent to an off switch, as they are fired and naturally commutated at the same time, hence they are never on. Hence, as all the four SCRs are always off, the output voltage is zero. Explanation: For obtaining the voltage control from V to 2V, the lower controller i.e. T3, T4 pair must always be on hence the firing angle from them must always be 0° ideally. Explanation: For obtaining the voltage control from V to 2V, the upper controller must be controlled by varying its firing angle from 0 to 180° whereas the T3, T4 pair must always be on hence the firing angle from them must always be 0° ideally. 8. A single-phase two stage sequence controller is designed to work on 230 V supply, and upper and lower current ratings must be 20 A and 21 A respectively. Find the transformer rating. Explanation: Transformer rating is Vs(I1 + I2). Explanation: In a N-stage sequence controller, n voltage controllers are used each having to anti parallel SCR pairs and each secondary is rated for Vs/n. Explanation: A sinusoidal voltage controller is used to obtain continuous voltage control over wide range with low harmonic content.